The current issue of BusinessWeek features a big collection of articles on personal challenges in the workplace. I eagerly read their article about work-life balance as this is something I struggle with, but I was disappointed to find that the article mostly consisted of stories about people who were already well off who simply just chose a different career. While that is one great way to improve your work-life balance, it’s really just one way to do it. In fact, it’s not even really a choice for many people. Quite often, we find ourselves in a personal or financial state where we simply can’t just pack up and switch jobs. Maybe we really like our jobs, but they just encroach on our lives too much. Maybe it pays really well. Maybe we’re afraid to make the leap into a new career, or we don’t want to rock the boat of our home life too much. Here are a list of fourteen additional techniques for improving your work-life balance that I’ve discovered over the past few years. Leave the office early, period. Easier said than done, right? Not if you set a departure time as a clear goal very early on. If you set an absolute time to leave earlier in the day, that time serves as a deadline to get your tasks done for the day, making you stay more focused throughout the day. Your reward? You actually get out of the workplace at a reasonable time. Try it! Tomorrow, define an exact time you’re going to leave early in the day and keep your eye on the clock throughout the day. Recognize that you need to get your required tasks done by then, and when you pull it off, get out of there and enjoy your work-free evening. Often, I find myself wasting time at work. I’ll surf to some of my favorite political websites, distract myself with something interesting to read, or play a game when I should be working. These things simply waste time – they’re a basic method of procrastination. My best method for counteracting this is by actually blocking the most distracting websites, and also closing all potentially distracting software that I’m not actively using (like my web browser). Try it! Close all of the programs that distract you, especially your web browser. If you don’t regularly use your web browser for work, hide it, so it’s harder to get to. … but actually take breaks. On the flip side of that coin, regular breaks to allow your mind (and body) a break from work tasks can be very helpful if they’re brief and spread apart. If you’re focused on your tasks for an hour or two, by all means, take a short break and do something completely different. Eat a healthy pick-me-up snack (like an orange), drink some water, and do something interesting (like reading The Simple Dollar, for example), but get back to work reasonably quickly. Try it! Make it your goal to spend the next two hours without any personal distractions, but then have a ten minute break where you get something to eat and drink and do something else. Write a “to-do” list for the next day before you leave. One of the biggest challenges at the start of a workday is simply figuring out what to do: what needs to be picked up and continued and what tasks need to be started? It’s easy to waste a bunch of time in the morning getting back in the flow, and that wasted time is often tacked on at the end of the day, preventing you from getting out of there. Instead, before you leave in the evening, make a list of the key things you need to do the next day and leave it right where you’ll find it in the morning, so you can just grab it and dig right in tomorrow without burning that start-up time. Try it! Before you leave from work, make a list of three things you need to accomplish tomorrow and leave it out where you can find it. Then, the following morning, pick up that list and immediately get started on the tasks. You’ll find that your morning is immediately more productive – getting you on the ball quicker and out the door quicker, too. Carefully consider your work goals, and tone them down a bit. Many people find themselves with a work-life balance that’s out of whack because they chose to take on more projects at work than they could reasonably manage. Usually, this results in work encroaching more and more on personal lives, to the discomfort of not only the worker, but the worker’s family and friends. Why do they do this? They hope to get ahead in the workplace, based on a perspective that it will make their life better. Instead, the chase makes their life worse. Why not step back and ask yourself what you really want and whether taking on more projects at work will really get the job done? Perhaps executing a small number of projects well is better than juggling a lot of projects and doing them poorly. Try it! Take a look at all of the ongoing projects you’re currently responsible for and see if there aren’t any that you can trim away or give to someone else. Also, make a commitment to not take on new projects until you can complete the ones you’re currently responsible for with a high level of quality. Have “focused sessions” at work, where you eliminate all distraction. Another aspect of modern work that keeps people in the office too late is distractions – people stopping by, phone calls, emails, instant messages, meetings, and so on. These little distractions destroy our train of thought and make it much more difficult to bring sustained focus to a project. The solution is to have short sessions (an hour or two) where you permit no distractions at all and focus on your work. Turn off your phone. Close your email program. Close your office door. Then, focus on what you need to do. Try it! For one hour, do everything you can to eliminate interruptions. Close your email program, turn off your phones, close doors that when open invite people in, and so on. Then, use this solid block of time to really bear down on your most important task. Whenever you accomplish a notable task or project, document it. Write down the date you completed it, as well as a detailed summary of what you did, and keep it someplace where you can easily retrieve it. Over time, these documents provide strong documentation of all of the work that you actually do. Not only does this help greatly with performance reviews, it also makes it clear how much work you actually accomplish. Try it! Start keeping a log of your significant accomplishments. You can either make a daily work log or just simply make a list of every significant thing you accomplish. Include details and don’t forget about it! … and then discuss a reasonable and more flexible work arrangement with your supervisor. If you’ve been working hard, accomplishing useful stuff, and maintaining a log of it, your next performance review should be a good one, and hopefully it will end with some discussion about performance-based rewards. Instead of just diving for the money, talk about some workplace flexibility, like some degree of flex time, the ability to telecommute on occasion, or other perks that will help you find more breathing room for the life you want to live. Try it! The next time you’re talking about a raise, instead talk about getting a more flexible work schedule. More flexibility with your time will save you that money anyway and will also improve your quality of life. Turn off routes of communication to work when you leave. Don’t check that email when you’re at home. Don’t leave that cell phone on. 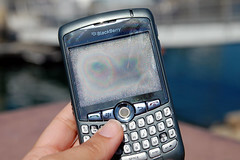 Leave the CrackBerry in your bag. Just turn them off when you leave and deal with the problem when you return. There are some jobs where you can’t do this – IT jobs come to mind – but for many jobs, you don’t have to let technology crash the work-home barrier. Try it! When you get home, shut off the technologies that connect you to work and just enjoy some uninterrupted personal time. After all, the freedom is what you work for, right? “Unwind” with something personally and spiritually fulfilling and relaxing. Many people “unwind” by vegetating in front of the television. Big mistake. While it can help you relax, it also provides minimal spiritual and personal fulfillment and is quite often loaded with tons of mixed messages, ones that we’re particularly susceptible to when we’re tired. Instead, seek out other ways to unwind. Perhaps sitting on a park bench will do the trick for you, or maybe you can unwind while playing with your kids. Meditation, prayer, and yoga also work. For me, actually, cooking can really do the trick. Try it! Instead of unwinding in front of the television, try another simple activity to unwind. Give meditation, prayer, or yoga a try, or go to a park and enjoy nature. Better yet, find a simple activity you really enjoy, even if it seems silly. Set aside blocks of uninterrupted time to focus on what’s really important to you. One of the biggest challenges I had in figuring out my own work-life balance was my children. They deserved my uninterrupted attention sometimes, and when I was juggling my full time job and my burgeoning writing, it was very difficult. The way I managed it was to realize that time with my children every day was of paramount importance, and so I just scheduled a three hour block of time each day that I spent solely with my family, usually from five to eight each evening. We ate supper together, played in the yard together, read stories together, and so on. Setting aside that block of time made my life bearable – without that time block, I would have felt very empty with regards to my life. Try it! Figure out which element of your life you’re missing the most because of a work-life balance that’s out of whack and set aside a block of time to focus solely on that element. It might just be a big block each week, or it might be a smaller block every day, but set aside that time for what’s most important to you. Get involved in a significant and personally important project outside of work. Some people tend to get absorbed in their job because they don’t have a deeply meaningful element of their life outside of work, so they let their job become their life. Over the long run, this is dangerous, as it wears you down and spits you out. A much better approach is to find a major project to involve yourself in outside of work, whether it be your family, a community group, a volunteer project, or something oriented around personal growth or fun. Try it! Spend some time to find out about and get involved with groups or projects of personal interest to you, and when you find one that really clicks, dig in deep and get involved. Actually use your vacation time, even if it’s just spent around the house. At my previous job, there were people who consistently lost their vacation time simply because they didn’t use it. Quite often, these same people were those who were tied to their desks and clearly unhappy about it, with that unhappiness eating into their productivity and effectively eating up the time they could be spending on vacation.Don’t let yourself fall into that trap. Instead, keep focused on your work and actually use your vacation, even if it’s at home. Take that time to do something fun and different or dabble in an area you’ve never tried before. Try it! Never let your vacation time lapse. Instead, always use it up – and use some of it to just stay at home and try some new things or complete some personal projects left undone. “Doesn’t a couple more hours of sleep eat into my personal time?” Sure, but if you’re exhausted, you’re spending more time getting less done at work and enjoying your time at home less, too. A solid night’s sleep vastly increases your concentration level, making you more productive at work and adding to your enjoyment of your personal life as well. Try it! If you feel tired on a regular basis, try to adjust your sleep so that you get closer to an optimum amount of seven to eight hours a day. If you get less than that, cut out some nonessential activities (like television watching) for sleep; if you get more, try going to sleep later or getting up earlier.